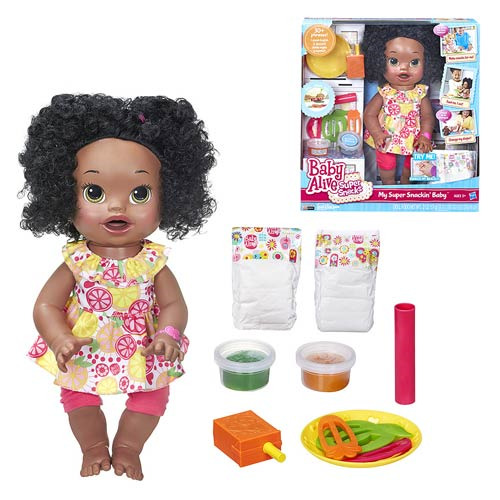 Little girls can have the love and fun of real babies with this Baby Alive My Super Snackin Baby Doll (African-American)! She's a sweet little doll who needs your daughter to make tasty snacks for her. Help her use the reusable doll food and shaping tools to make different kinds of snacks to feed her Snackin' Sara doll. Then it's changing time! The doll tells her when she's hungry, sleepy, or full with phrases in English and French, like "Is it snack time?" You'll love watching your little girl learn about being a mommy with the Baby Alive My Super Snackin Baby Doll (African-American)! Includes doll, outfit, 2 diapers, two 1-ounce containers of reusable doll food, 3 shaping tools, 1 roller, plate, pretend juice box, and instructions. Required 3x "AAA" batteries, demo batteries included. Ages 3 and up.